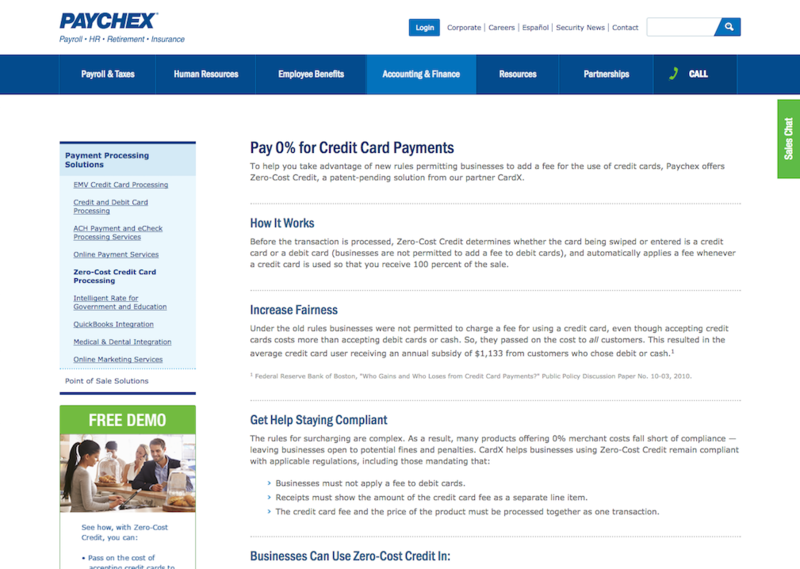 Paychex is now working with CardX to provide its clients the option to accept credit cards without paying any fees. CardX, a technology provider of card acceptance solutions, today announced a strategic partnership with Paychex, Inc., a leading provider of integrated human capital management solutions for small- to medium-sized businesses. This partnership will allow Paychex to offer its client base a fully compliant solution with a 0% effective rate for credit card acceptance. New rules, per settlements with the card brands, allow businesses to pass on the cost of processing credit card payments. However, the rules are complex, and many products offering 0% merchant costs fall short of compliance—leaving businesses open to potential fines and penalties. Through this partnership, Paychex will offer its clients Zero-Cost Credit, a solution that keeps businesses compliant with the new rules, including (among others) the requirement that businesses must not apply a fee to debit cards. Zero-Cost Credit works by applying a fee whenever a customer chooses a credit card. The business collects the credit card fee from the customer, and that fee covers the entire cost of credit card acceptance, dollar-for-dollar. For the first time, then, businesses for which the cost of processing credit cards is prohibitive can offer their customers the convenience of credit card acceptance. And, when a debit card is presented, Zero-Cost Credit automatically applies no fee, providing customers the option to pay with debit at no additional cost to them.